Did you know the first bicycle that was made in 1817 by Baron von Drais didn't have any pedals? People walked it along. Then in 1865, pedals were added and people could ride their bicycles. The bicycles were made of wood. The first metal bicycle was called the High-Wheel or Penny Farthing. People had a hard time keeping their balance on this type of bicycle. Tricycles have 3 wheels. Even grownups ride tricycles. This is what an old airplane looked like. The Wright Brothers invented one of the first airplanes. It was called the Flyer. They flew it at Kitty Hawk, North Carolina in the United States. 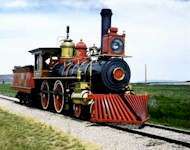 The first steam powered passenger train was invented by Robert Stephenson in 1825. This is the fist pick-up truck in the world. It was made by Gottlieb Daimler in 1886.
Who made the first taxi? How many bones are there in your hand?